Recently it was "dress as your favourite book character" day at school. For the uninitiated this occassion is also known as send-your-mother-to-the-edge-of-madness-with-some-completely-outlandish-costume-request. So when Argy announced he wanted to go as "The Gruffalo" with his terrible tusks and terrible claws and terrible teeth in his terrible jaws, I had to do some quick thinking. "Er yes, wow, that's a great choice" I said, all the while trying to fathom how to construct terrible tusks and teeth. But then a brainwave: "How about the Mouse?" I suggested, hopefully. "Isn't the Mouse the hero of the story?" Argy looked a little uncertain, but agreed. I swung into action (before he could change his mind) and started rifling through my pattern collection. Mouse, mouse, mouse ... surely there must be something here. Sure enough, I found a pristine Simplicity 2506 - view D included a sort of hood with mouse ears. Excellent. 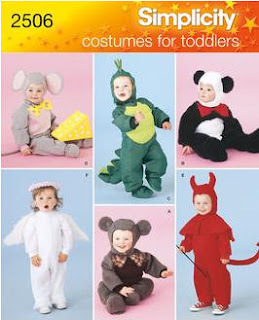 But my moment of triumph dissipated when I saw the words "Costumes for Toddlers". Yes, there was no denying it: the pattern envelope clearly showed a bunch of smiling babies modelling the costumes. Bother. I looked back and forth between the pattern and 6-year-old Argy's well-above-average crown circumference. This was going to call for a little ingenuity. I traced off the hood pattern pieces and then after taking a few flat pattern measurements, decided to employ an alteration technique called the LNA ("Large Noggin Adjustment"). The LNA (which is sometimes also referred in the trade as the "Big Head Spread"), involved slashing and adding extra real estate to all the pattern pieces making up the hood. With the addition of a couple of darts, the fit was good and I was able to make up a snug mousy hood in brown fleece and beige tricot. I was quite pleased with the result. That is, except for a lingering doubt: when I changed the size of the hood, should I have graded up the mouse ears? I soon knew the answer. On the morning of "dress as your favourite book character" Argy proudly wore his costume to school. "Hey ... look its a koala" yelled someone. With my costume-making pride just a little dented, I tried to see the bight side. 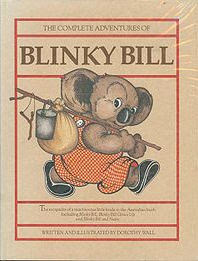 At least that's next year's costume sorted: Argy can go as Blinky Bill. we love that book and we love those mouse ears! Great job! I think the ears are the right size - if you did the book illustration one's they would be huge ;) Book week dress up day at my son's school is a big deal (read - competing against purchased costumes- and it is a competition for best dressed). Talk about stress! Very nicely done! We love dress ups around here. There was no book week dress up at C's school for which I am a little bit grateful I must admit. PS "big head spread" = genius! Well done! I am slacker mother when it comes to book week... 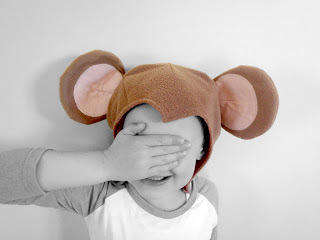 I dont go into any great length of trouble... Maybe for the youngest I might... poor older two! You made me laugh, LNA - love it!! I think he looks like a mouse - great job. I never had to do that when my kids went to school - thank goodness!! 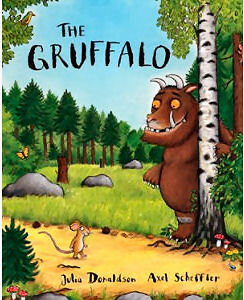 Big Gruffalo fans here too - quick thinking about the mouse being the hero of the story - purple prickles would have been hard to make I think! Oh I have missed you! Bet big mouth's mother doesn't sew and he was wearing some plastic shop bought ugly. And anyway.... Koala's are grey, aren't they? Very clever - amazing mum/sewer alert! Lucky kiddo! Classic! From the mother of last year's Fantastic Mr Fox. Er.....Blinky aint shy in the ear size department either...you make me appreciate the fact that our school doesn't dress up for book week. Good save all round, I must say. Hey there! Do you somehow test if your personal content is unique in the web and no other person is it without making sure you know about it?